As part of the Unity Events team, I am happy to announce the photo op schedules for Unity Days 2017. You will find them below! Below is a chart with the Unity Days promo pictures (Full credit goes to Unity Events Canada for the promo images) of the Unity Days cast activities prices. Please bear in mind that the prices are in Canadian, and must be converted to the dollars based on your country. Do you like music? Do you like live events? Do you like multi-talented people like Christopher Larkin, who plays the intelligent engineer with a heart of gold on The 100? Do you like positivity and bringing fandoms together to make a change in this world? Heck, do you like meeting new people who share the same love and passions as you do? If you answered “Yes” to these questions (C’mon, admit it, you did! ), then I have a great thing for you! Unity Days and Cancer Gets Lost are merging together to bring you a benefit concert! 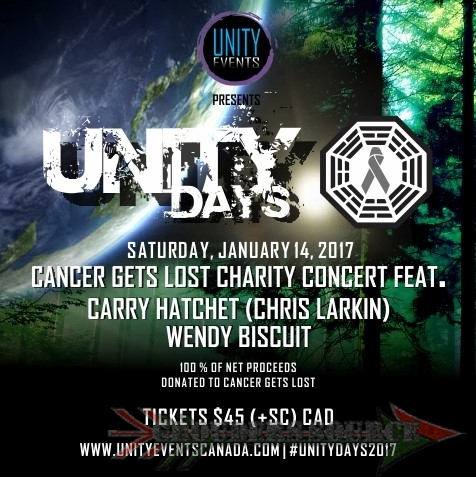 On Saturday, January 14th, 2017, Cancer Gets Lost (a nonprofit organization to raise money for various nonprofit cancer societies), and Unity Days will bring a concert with Carry Hatchet, Christopher Larkin’s musical solo project, and up and coming swing artist, Wendy Biscuit. The net profits gained will be donated for Cancer Gets Lost. Cancer Gets LOST is a non-profit charitable endeavor co-founded by Executive Director Jo Garfein and Jared Wong to raise money for various cancer support charities through auctions and fundraisers featuring rare and autographed pop culture memorabilia. We focus on channeling fandoms toward the greater good! In 2012, CGL produced and hosted a live webcast and fan party in Los Angeles with LOST alum (cast and creative); it coincided with a very successful online auction of LOST and TV/film memorabilia, props and autographed items. 100% of the proceeds were donated directly to the National Brain Tumor Society in honor of Jo’s dear friend Jackie, who passed away in 2012 after fighting brain tumors and cancer with great spirit for four years. In 2014, CGL partnered with Blacksparrow Auctions and together they hosted an online charity auction in September. 100% of the proceeds (almost $80,000!) from all CGL items in the auction benefited the American Cancer Society, in support of Jo’s mother-in-law, who is battling pancreatic cancer. Our next charity auction will launch online on 8.15.16, benefiting Alex’s Lemonade Stand! * CGL has non-profit, tax exempt status thanks to fiscal sponsorship by FJC: A Foundation of Philanthropic Funds. Via cancergetslost.org Please visit them for more information about this wonderful foundation. Unity Days is a three-day convention in Vancouver for The 100 fandom can embrace one another and meet and hang out with the cast of the series. There will be panels, photo-ops, cocktail events, and much more! For more information and for purchase options, please visit unityeventscanada.com. To stream Carry Hatchet’s full album, and to find out more, please access here. To follow Christoper Larkin on Twitter, you can click here. To learn more about Wendy Biscuit, and her music, please access to her site at wendybiscuit.com. Follow Grounders Source on Twitter @Grounders Source, and like on Facebook @GroundersSource. You may also leave a comment below.